One of the biggest joys of being an Extension Educator is hearing the stories of others and sharing the highs and lows of daily life. I love living in the community, and have come to realize that if I want it to be a better place, it begins with conversations with others. Every day, each one of us lives in joy, in sorrow, in anger, in sadness, in the known and in the unknown. And yet, we don’t always share with another the truth of how we are feeling. When asked, “How are you?” A standard response is “Good”. When in reality, we are happy, excited, frustrated, sad, exhausted, silly, or many other emotions. It is so important that we begin to share our emotions with one another, that we share one another’s joys and sorrows. Each of these questions, asked with honesty and openness, led to a shared discussion for everyone present. The beauty in those moments was the community that was built for each person present. The NIH also reminds us that “positive social habits can help you build support systems and stay healthier mentally and physically.” Through our relationships with others, we learn how the world around us works. Being in relationship with others is an important part of our well-being. What are the ways that you are involved with others each day? Some places you might be involved within your community are: service groups, exercise, social groups, family, athletics, work, school events, the grocery, driving from here to there, and many more. Building a community is the responsibility of each of us. Be vulnerable. Try something new. Reach out to someone you have not talked to recently. Through our sharing of our life experiences, each of us will learn that we are not alone and we are loved. Take time today to reach out to the community you currently have created and don’t be afraid to look for community wherever you are. For most people, this time of year is filled with happiness and good cheer. However, many individuals dread the coming of the holiday season and the sadness that it brings. What causes the holiday blues and what can we do to help alleviate the sadness that overcomes us? High Expectations Don’t worry about having a perfect party or family get-together. Instead try to maintain realistic expectations and have a good time. Overdoing it Trying to attend every party and get-together will only make you tired and feeling worn-out. Try to stick to your usual routine, including meals, exercise and sleeping habits. Try to avoid drinking too much alcohol, which can depress moods. Spending too Much We all want to please others and buy that perfect gift, but paying the bill in January can be stressful. Make a budget for gifts and stick to it! Unpleasant Holiday Memories Try not to think of holidays that were sad and lonely. Create pleasant memories by starting a new tradition. Being Single, Alone or Divorced Call a friend and make plans to get together over the holidays. Invite them to lunch, an uplifting holiday movie, or a walk around town to view the holiday decorations. Emphasis on Shopping and Commercialization Consider giving a donation to a charity in lieu of a gift that the recipient won’t use. If you find yourself feeling down any time of year, make a list of the good things you have in your life. Another way to feel better about yourself is to volunteer your time to help someone less fortunate than you. Finally, we all feel down sometimes but if the “blues” last longer than a few weeks, don’t hesitate to talk to your doctor or seek professional help. Submitted by: Jennifer Even, Extension Educator, Ohio State University Extension, Hamilton County. 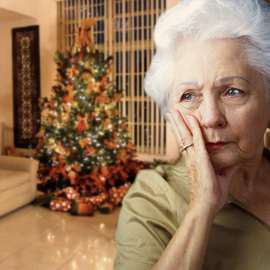 Source: Judith S. Beck, PhD, Huffington Post, Avoid the Holiday Blues.